The AQUAEL MINI UV is a unique device. It has the form of a short sleeve that is installed on the outlet of the filter. Four energy-efficient UV-C emitting LEDs are located in its interior, effectively sterilizing the water flowing out of the filter. 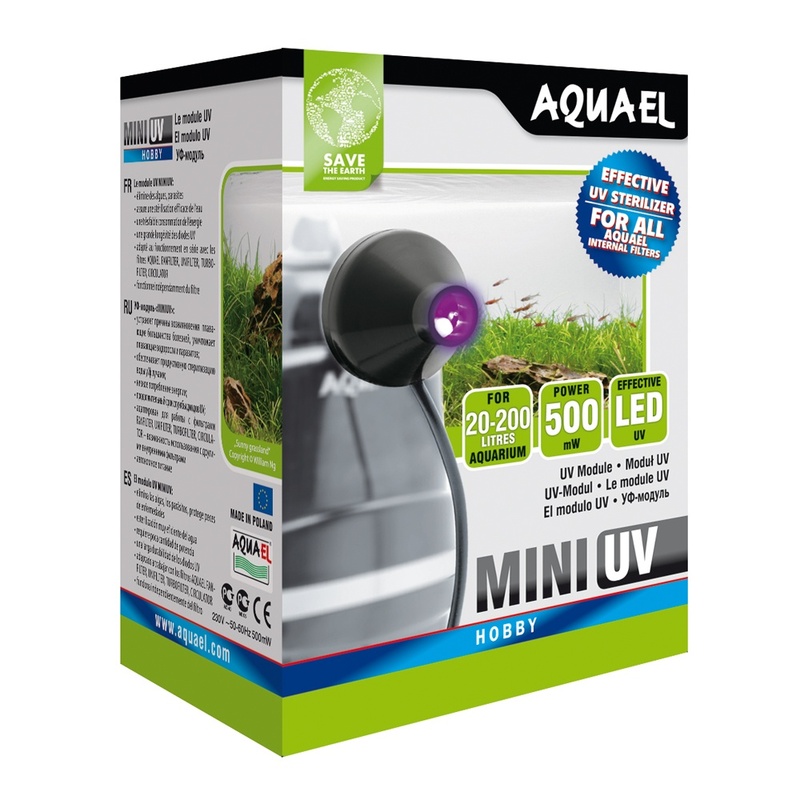 The AQUAEL MINI UV is a unique device. It has the form of a short sleeve that is installed on the outlet of the filter. Four energy-efficient UV-C emitting LEDs are located in its interior, effectively sterilizing the water flowing out of the filter. It is adapted for cooperation with all lines of internal AQUAEL filters (FAN, UNIFILTER, TURBO FILTER, PAT MINI). It perfectly removes algae from the water preventing it from greening. It kills pathogenic bacteria protecting the fish from diseases. It also destroys protozoa that cause water clouding. The efficiency of UV LED was already tested in the UNIFILTER UV POWER filters and UNI UV modules for the UNIFILTER filters. What is more, it is easy to install and does not require additional maintenance. As it is powered independently it can be turned on and off at any time. Because of the size, the sterilizer does not blemish the inside of the tank and it can be also used in very small aquariums such as e.g. AQUAEL SHRIMP SETS used for keeping shrimps.